I heard the clip clop of horses hooves and then saw this charming old fashion carriage drawn by two white marble horses. What a unique way to see some of London's sights. I had visions of me riding through Hyde Park and imagining myself in another time. The drivers tell me they are popular with men wanting to make a surprise proposing. Makes the men go quite romantic, even getting down on one knee. They've all said yes so far. How romantic of the men to propose this way in present time. I expected they would propose on the internet. Fantastic find. Yes I can see you sitting there, giving the royal wave to the crowds as you pass by. I was gonna say.....! I assumed it would have been a wedding carriage or something. They have these in Montreal and in New York City all year round. This is a lovely symbol of London. No, Mo, I don't necessarily know a lot of artists. I just go up to people and talk for a while and ask to take their photographs. Artists interest me. 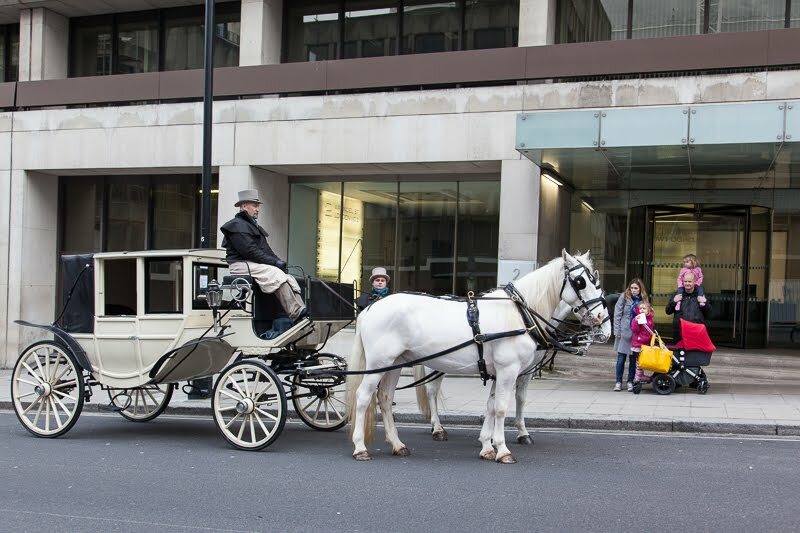 I simply love the idea of a Horse Drawn Carriage in London. Imgaine riding through the Traffic!